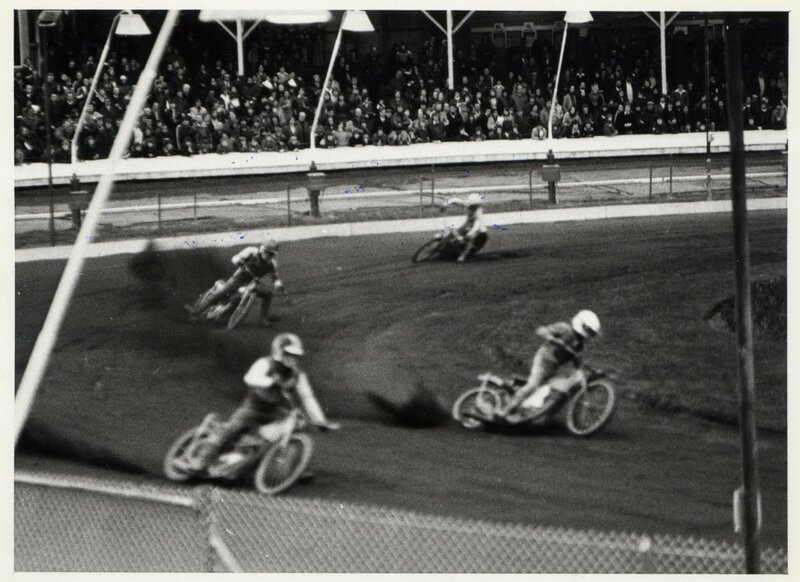 Old Meadowbank closed in 1967, Speedway barred from the new setup as a professional sport (what a farce). After two seasons at Coatbridge, supporters had to wait seven blank summers before the famous city centre Greyhound Stadium at Powderhall admitted the sport, with Mike Parker promoting. Opening night was 15th April 1977, the visitors Berwick in a challenge. It is quite an evocative shot if a little blurred - the only one we have from that first meeting. It is heat one on the deep track, with Bert Harkins contesting the lead with the eventual winner Willie Templeton. Alan Bridgett and Mike Hiftle follow. Mike Parker has said the crowd was 11,000, though it seems hard to imagine how that many could get in.